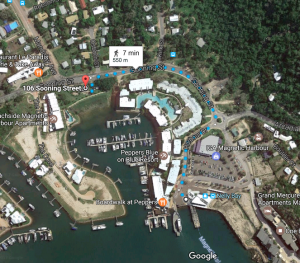 from one side of Magnetic Island to the other and finishes at the Arcadia Village Hotel. There will be a 10km and a 20km course and a new 6km course. Getting there: There are 3 ferries with timings that suit to get you to the start line on time (11.30am,12:55pm, 2:15pm). Please try and take an earlier ferry – If everyone takes the 2:15 you wont all fit! Make sure you take those early ferries to have plenty of time on the Island to get yourself set up and signed in. SeaLink is on board again this year, offering all competitors a 20% discount on ferry tickets. There will be a list of names at the counter, so make sure you mention the trail run and your name to receive your discount. Where: The run commences from Nelly Bay on Magnetic Island. On leaving the Ferry Terminal turn LEFT towards Picnic Bay. The start line is 100 metres along the road on your left in the park. It will be clearly marked. Rego Open from: 2pm. You will be required to sign in and be allocated a race number. Merchandise:. There will also be merchandise and race nutrition for sale. Gear Drop: A presonal bag per competitor will be transported to the finish line for you. It must be clearly marked and placed in the allocated gear drop area near the registration desk. For the 20km course runners a gear drop will be at the 7km/12km point (Radical Bay turnoff), please ensure you clearly mark any gear you would like to have available at this point. Mandatory Gear: There is no mandatory gear for the run. We have marshals on the course, a vehicle and first aid available. Some gear you may wish to take includes compression bandages, a phone (there is limited service along the course), energy gels/bars, hydration. –> IMPORTANT –> 20km competitors might want to bring a headtorch, as it will be getting dark towards the end of the run!! Water: It is reccommended that you take at least 500ml of water per hour that you expect to be running. There are creek crossings with flowing water which you may wish to utilise. There is no provided water on the course. Facilities: There are toilets located at the start/finish line. The course is run through the Magnetic Island National Park, please ensure you do not litter along the course and respect the National Park. The park will also be open for day users so please be mindful and courteous of other users. The 6km, 12km and 18km course will be clearly marked with pink tape, signage, arrows and caution tape. Each track junction will have a sign with directions on which way to go depending on which distance you are completing. There will also be course marshals at each significant turn. Essentially, all 3 courses will commence running up Mandalay Ave and follow the Mandalay walking track to Arcadia Bay. The trail is technical single track winding it’s way up over the Island with stunning views to Horseshoe Bay. 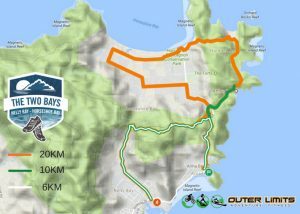 The 6km course drops straight down into Arcadia Bay. The 12km and 18km course take a left and head to the Forts car park. The 10km runners take 4km out and back down Radical Bay Road and then it’s all down the Telstra Track to the Arcadia Hotel. 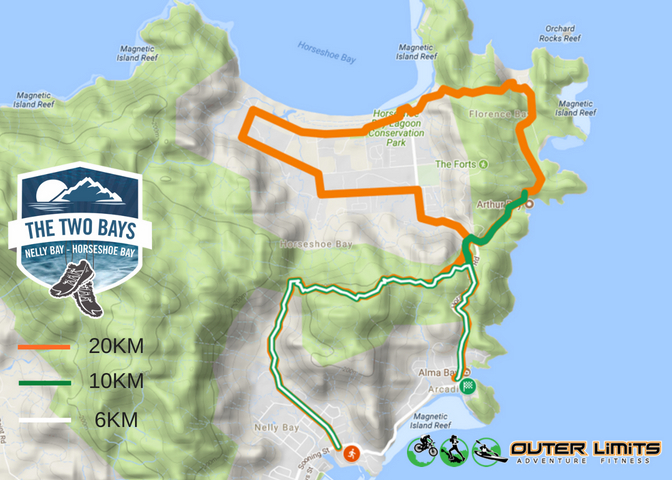 The 20km runners (take the old 10km course) take the track beside the road heading to Horse Shoe Bay, past the put along the foreshore and over the trail to Radical Bay (now running the old 20km course in reverse) then up Radical Bay Road and down the Telstra Track to Arcadia. Finish Line refreshments: There will be an array of fruit, water and electrolyte at the finish line for competitors. Dinner: Arcadia Hotel is offering discounted meals for all runners from 6pm. 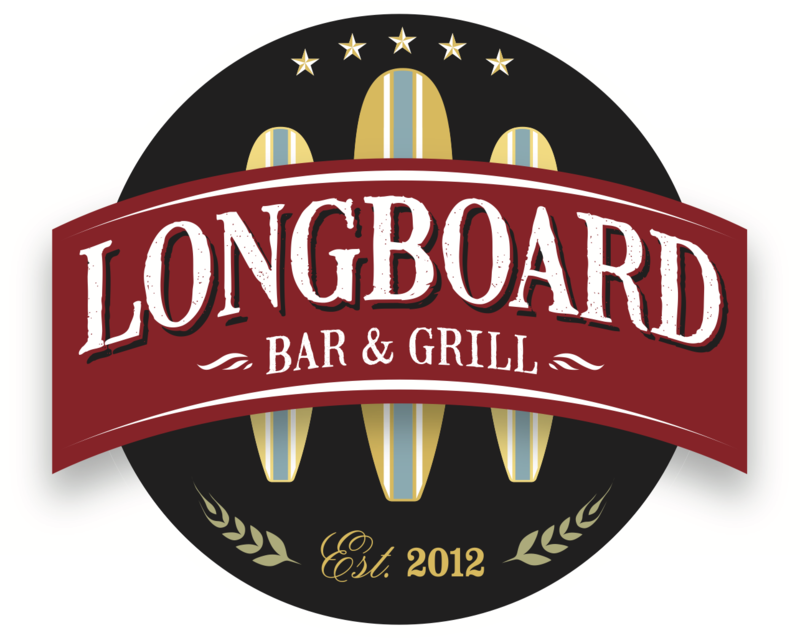 There will be live music and it will be a great atmosphere so we encourage you all to stick around and take advantage of the great location. Getting Home: There are 3 return ferries that will be suitable, 6pm, 7:15pm and 9pm. You will have to catch the sun bus (or walk) from Arcadia Bay to meet the Ferry at the terminal in Nelly Bay. Safety: The trails include sections of challenging and technical single track, be sure to exercise caution on these sections. If you DO NOT FINISH the race you must see a race volunteer or contact race HQ. Volunteers: We need a handful of course marshals and time keepers for the event. 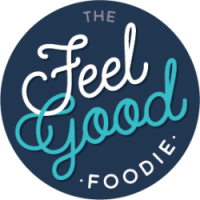 All volunteers receive FREE ferry tickets and FREE meal at the pub. Please contact us if you or any of your family are interested.